It’s time for another tour! This time, we’re celebrating the writings of John Steinbeck. John Steinbeck lived from 1902 to 1968, writing more than two dozen books, including fiction, nonfiction, and stories. Steinbeck won the Pulitzer Prize in 1940 for The Grapes of Wrath, and in 1962, he was awarded the Nobel Prize in Literature, an award given to an author with the best body of work. I’d like to thank Karen from Books and Chocolate for her help in compiling this information. The button is a government image of an Okie family packing up their car to travel out of the dust bowl during the Great Depression. 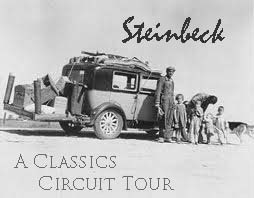 Since this is the subject Steinbeck’s Pultizer Prize-winning novel (The Grapes of Wrath), it seemed a significant image to use to promote our own tour around the blogosphere. Feel free to download the button for your own use. Although the tour dates are not determined yet, the tour will probably run beginning August 15 and going until about August 26, depending on how many people have signed up. We will email an assigned day. You are to post on your blog on your assigned day. If you are coming to this late and would really like to participate, send an email to rebecca[at]rebeccareid[dot]com with your blog url, the book you’d like to write about, and your available days. Please contact me before the tour begins. The Pastures of Heaven (1932). A short story cycle consisting of twelve interconnected stories about a valley in Monterey, California, which was discovered by a Spanish corporal while chasing runaway Indian slaves. Written in classic Steinbeck style, the lives of the families that relocate to the valley are portrayed with a mixture of humor and poignance. A recurring theme in the book is the pain caused when people try ineptly to help or to please others. Cup of Gold (1927). A novel based on the life and death of privateer Henry Morgan. It centers on Morgan’s assault and sacking of the city of Panama, sometimes referred to as the ‘Cup of Gold’, and on the woman, fairer than the sun, who was said to be found there. Cannery Row (1945). A series of vignettes about a few people living in Monterey, California. Sweet Thursday (1954). A sequel to Cannery Row that takes place after World War II. The Red Pony (1933). An episodic novella (four different stories) about a boy named Jody Tiflin. Of Mice and Men (1937). A novella about two migrant ranch workers during the Great Depression. To a God Unknown (1933). A short novel exploring the relationship of man to his land. The plot follows a man, Joseph Wayne, who moves to California in order to establish a homestead, leaving his father, who soon dies. Tortilla Flat (1935). A novel set in Monterey, California, portraying with great sympathy and humour a group of paisanos – literally, countrymen – a small band of errant friends enjoying life and wine in the days after the end of the Great War. In Dubious Battle (1936). A novel about a strike in California, with the Communist leaders trying to rally the picketers together. The Grapes of Wrath (1939). A Pulitzer Prizing winning novel about a family of poor sharecroppers driven from their home during the Great Depression. The Wayward Bus (1947). A novel written as internal monologues for characters in Salinas Valley, California in the years after WWII. The Pearl (1947). A novel based on a Mexican folktale, exploring the secrets of man’s nature. East of Eden (1952). An epic novel tracing the lives of two families in Salinas Valley, California. The Winter of Our Discontent (1961). Steinbeck’s last novel, about a former New England aristocrat now clerking in a store. The Forgotten Village (1941). A film documentary written by Steinbeck about the clash between traditions and modernizations in a traditional Mexican village. The Moon Is Down (1942). A military propogranda novel about the occupation of a northern European town. Bombs Away: The Story of a Bomber Team (1942). A nonfiction account of Steinbeck’s involvement in a bomber team, commissioned by the Armed Services department of the USA. A Russian Journal (1948). A nonfiction account of Steinbeck’s travels through Russia during the early years of the Cold War. The Log from the Sea of Cortez (1951). A narrative nonfiction account of a 1940s marine expedition with Steinbeck’s friend Ricketts. Once There Was A War (1958). A nonfiction novel about ordinary people during a war, written when Steinbeck was a special war correspondent (WWII). Travels with Charley: In Search of America (1962). A travelogue with his poodle, Charley. Burning Bright (1950). An experimental morality play written in the form of a novella. The Short Reign of Pippin IV: A Fabrication (1957). A political satire that pokes fun of France. America and Americans (1966). A collection of Steinbeck’s journalism. Viva Zapata! (1975). Screenplay for a fictionalized-biography of a Mexican revolutionary leader. The Acts of King Arthur and His Noble Knights (1976). A retelling of the Arthur legend, based on L’Morte D’Arthur by Sir Thomas Mallory. This entry was posted on June 26, 2011, 6:16 pm and is filed under Intro and Sign Up, Tours. You can follow any responses to this entry through RSS 2.0. Both comments and pings are currently closed. I can’t participate in this one but wanted to stop in to say it looks fun!! I wish I had time. The Grapes of Wrath is calling. The only Steinbeck I’ve read so far is Of Mice and Men, which I liked a lot. This looks like a fabulous tour! I can’t wait to read everyone’s reviews. I’m looking forward to following the reviews on this tour. Can’t participate myself, this time, as I haven’t read any Steinbeck before and won’t have the time next month. I’m really looking forward to this, can’t wait to get started.